Captures a point of time where the "classic" Maiden line-up were at the very top of their game. In some ways 1988 proved to be something of a watershed for Iron Maiden. Their star was on the wane in the States – where they'd spent many months and thousands of road miles trying to crack throughout the 80s – who were struggling to come to grips with the new proggier direction of the band's current concept album 'Seventh Son Of A Seventh Son'. In the UK, on the other hand, they were as popular as ever, scoring a number one album and no less than four hit singles with 'Seventh Son...' and playing a triumphant headlining set to a record 107,000 fans at Donington Monsters Of Rock. 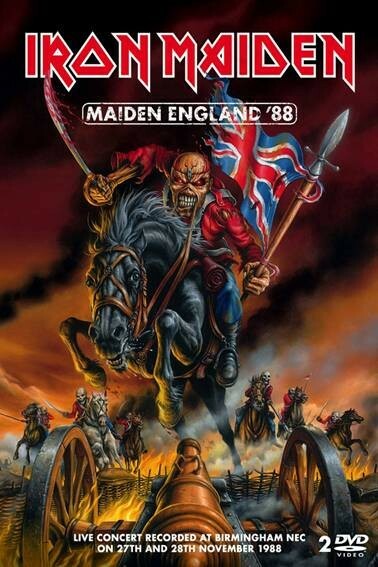 In eight short years Iron Maiden had risen to the very top of the metal tree and 'Maiden England', recorded over two nights at Birmingham's NEC in November of that year and receiving its first ever release on DVD, finds the band at the height of their popularity – somewhere I don't think they've ever truly scaled again in this country. Re-titled and re-packaged with new artwork, 'Maiden England '88' has been meticulously digitally re-mastered, frame by frame, by their long-time live video director Andy Matthews and looks and sounds stunning. It's a very different concert film to 'Live After Death, which received a similar DVD re-issue a couple of years back. This time Steve Harris occupies the director's chair and, through tight angle shots, produces, what he feels, is more of fans eye view of the Maiden live experience. He pretty much achieves this but, considering they were playing to the largest UK indoor arena audience thus far in their career, he fails to capture the scale of the event, with little in the way of back of the arena or audience panning shots. In many ways, it ends up as more of a made for TV special rather than a truly cinematic experience. The sound is much rawer and in your face than 'Live After Death' but the guitars are far too clean – probably as a result of the guitar synthesisers they were using at the time. The set list, whilst heavily influenced by material from 'Seventh Son...', is a veritable feast, where long lost fan favourites like 'The Prisoner', 'Killers' and 'Die With Your Boots On' are all given an airing. If that's not enough, the encores that were edited out of the original 1989 VHS release have also been restored. Extras include the third instalment of the 'History Of Iron Maiden', which proves to be rather unsubstantial, preferring to paper over the cracks that were definitely appearing in the band at the time. Much better is the long forgotten feature length documentary '12 Wasted Years' that charts the rise of the band, with plenty of vintage clips and mid 80s interview footage, and provides some entertaining early Maiden nostalgia. For all its faults, this long awaited DVD re-issue captures a point of time where the "classic" Maiden line-up were at the very top of their game.